Specially formulated with Chlorhexidine to protect teeth and gums. The alcohol free formulation helps protect teeth by strengthening and remineralising tooth enamal, whilst the anti-bacterial action helps fight plaque to prevent cavities and maintain gum health. Use after interdental cleaning and brushing to complete your oral care regime. Use with Gum Health Protect brush and toothpaste for the ultimate protection of teeth and gums. DO NOT SWALLOW. Keep out of reach of children. Not suitable for use by children under 12 years of age. Discontinue use and seek immediate medical help if you experience any of the following: a rash, swelling of the mouth or face or have difficulty breathing. These effects may be symptoms of an allergic reaction which is very rare. If irritation occurs, as with any other oral care product, discontinue use. Use of this product may temporarily discolour teeth, this can be removed by twice daily brushing or by your dentist or hygienist. You can avoid staining by not drinking tea, coffee or red wine, especially up to one hour after use. 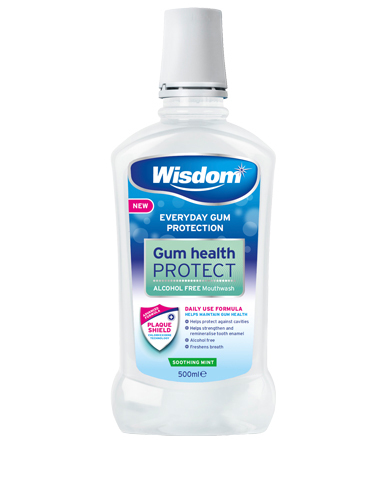 Part of the Wisdom Gum Health Protect oral care range.